A ONE-BEDROOM unit has sold for a staggering $2.625 million — not in Sydney, but right here in Brisbane. 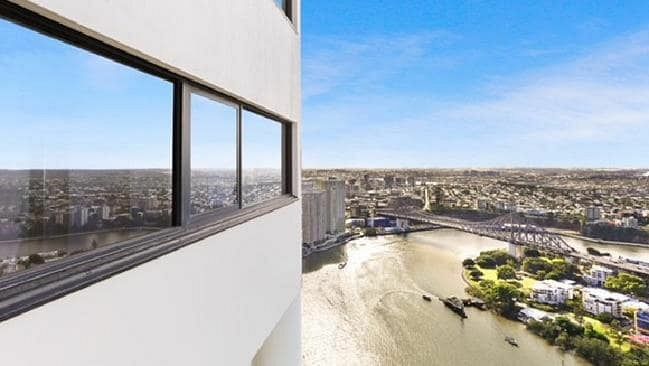 The sale of the riverfront apartment in the Riparian Plaza building in Brisbane’s CBD shows buyers are prepared to pay top dollar for high quality units, despite concern about an oversupply of inner city apartments. The unit at 4103/71 Eagle Street is bigger than many houses with its 323 sqm of floor space. It originally had three bedrooms, but was converted into a one-bedroom apartment with a media room. The sale was negotiated by Drew Davies of McGrath Estate Agents, who said the unit was snapped up by a buyer on his database before it could even make it to market. “I had photos taken for this phenomenal home last Wednesday and it was sold by Friday morning before I could get it online!” Mr Davies said. The bedroom has become a master suite with a walk-through robe, ensuite and powder room. Records show the property sold for $2.3 million in 2015 when it was a three-bedroom, three-bathroom apartment. “There are a lot of people buying high-end apartments who don’t necessarily need the extra bedrooms, but still want the extra space,” Mr Davies said. Mr Davies said they ranged from downsizers to Sydney executives wanting a property they could “lock and leave”. He declined to comment on the buyer or vendor of the property. It comes as demand and prices for luxury, riverfront apartments in Brisbane reach new heights. A unit in Newstead recently sold for $2.5 million in a deal negotiated by Matt Lancashire and Brandon Wortley of Ray White New Farm. The four-bedroom, industrial chic penthouse at 5a/5 Kyabra Street was designed by award-winning architect Justin O’Neill and spans 478 sqm over two levels. And in Kangaroo Point, two apartments have just been sold by Courtney Maguire and Simon Caulfield of Place Kangaroo Point. A three-bedroom unit with a private marina berth and river views at 5E/39 Castlebar Street fetched $1.85 million, while a ground floor villa at 110/1 Holman Street has changed hands for $1.8 million.